Yeah, I know it has nothing to do with horror but I didn't actually make it to the pawn shop yesterday to buy any more films to review so this is all I have to offer as a Sunday post. I'm really looking forward to "The Dark Knight Rises". I'm a big fan of Batman, but an even bigger one of Catwoman (as you already know). Ah, who am I kidding? I just want to ogle Anne Hathaway like everyone else does. Meow!!! Yeah, she makes my Dark Knight rise alright. 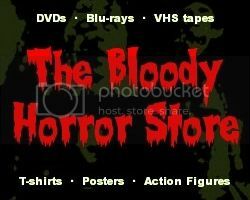 In other news, I've been updating "The Bloody Horror Store" which now has a graphical link to it in the side column. I added a few more horror items here and there which may interest you. You aren't even reading this though now that you've seen that big pic of Anne Hathaway, are you? Tomorrow, I'll review something. I'm not sure what yet because I wanted to do a month of ghostie films and I'm not really in the mood for any of them. Any suggestions for what I should review? Just leave them as a comment below.